The booking engine is a database with interface functions shared by multiple companies and websites. Sharing a centralised booking engine has many advantages, like sharing costs and possibly offering a worldwide range of travel destinations on one or more portal websites. Of course each company can only access its own data. It contains the data that can be accessed and stored by one or more websites. It offers functionalities like a booking form. It can connect to a payment module (optional). It handles the communication with the customer and the DMC (usually by email). It can exchange data with Jambix (optional). The Business to Consumer (B2C) website is the sales channel connected to the booking engine. It is usually developed, hosted and maintained by us (but that is not an absolute requirement). It will have a Content Management System (CMS) to allow a company to manage its own pages, images, texts, products, etc. The general design, interface, structure as well as general pages are custom made. The design is completely up to the company and can also be done by third parties. Customers will visit the website, can browse the services and products on offer, and follow up on whatever they prefer. The presentation (pages, images, etc) is done by the website but the actual data come from the Booking Engine. The booking procedure also comes from the Booking Engine; this is handled by a standard booking form. The procedure needs to be strict and safe. Therefore the form is a part of the Booking Engine which is embedded in the website and will run under a secure connection. Optional extras can be added to the website(s) or booking engine. Contact us for your extra requirements. After receiving booking requests, the company may want to process them in a back-office system, send out invoices, issue vouchers, etc. This is not included in the booking engine; connecting to Jambix or another back-office system is one of the services offered as an optional extra. The booking engine is not limited to a single B2C website only. Once the necessary data (suppliers, products, prices, bookings) can be exchanged with the Data Service and Booking Engine, it is available for more than one sales channel. So other websites can also make use of the Booking Engine, allowing these websites to access the database, booking interfaces, optional extras, etc. In general, an extra Channel would be an extra website. By setting up a separate channel, it is possible to assign a separate set of products and prices to that Channel. This allows companies to have separate websites for different markets: budget travellers, upmarket customers, sailing, horse-riding, etc. Exchanging data with other back office systems may also be possible. Depending on the requirements, a connection between the other system and the Booking Engine could be developed on request. Optionally, companies that work with the Jambix Travel Management System could enter suppliers, products and prices in that system. Jambix will automatically upload a selection of these (as defined by the company) to the Data Service, which is an intermediairy container of data. Users can manage products in Jambix and set prices per market, in this case the market being a website. Users can export from Jambix (a selection of) the products, prices and bookings to the Data Service and Booking Engine. After a consumer submits a booking/request, the Booking Engine not only stores it, but also inserts the booking in Jambix. Jambix notifies users within the system. 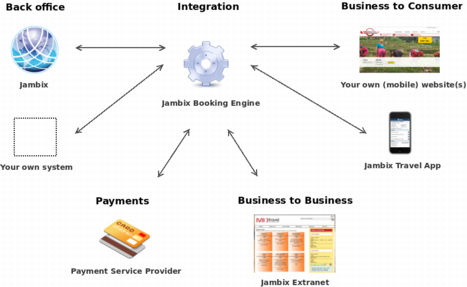 A user handles the booking in Jambix with the suppliers and determines if a payment is required from the customer. • to make data and files available to the Booking Engine and MyBookings (optionally). • to make data and files available to other channels like a (B2B) website (optionally). After any changes, the Booking Engine can update the booking in Jambix and the system notifies users using the tasks system. Costs will depend on requirements per company.